Astronomers are not still quite sure about the given theory of the origin of planets that explains how the initial dust develops into a planetary system. 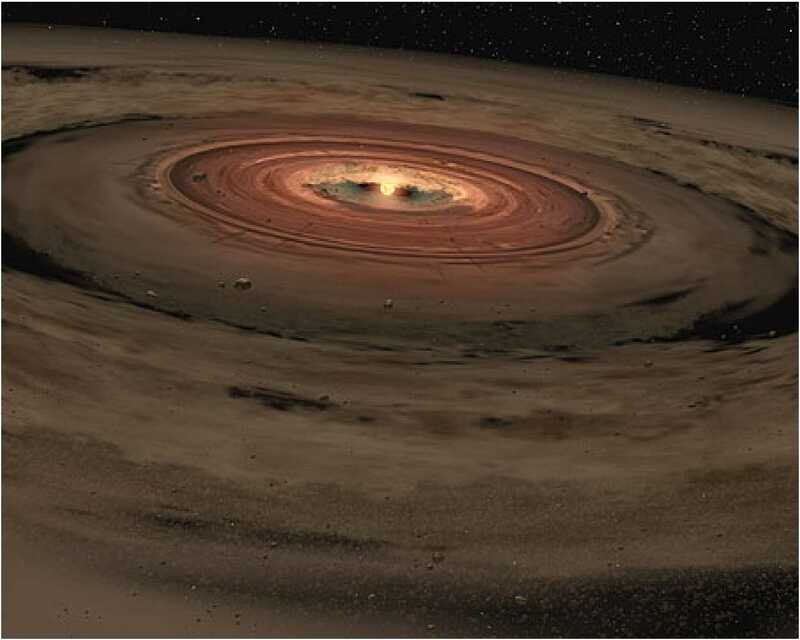 A new research has been conducted on this by a French-UK-Australian team, they think that they have the answer, with their simulations that shows the formation of dust traps, where pebble-sized rubbles switch together and make the building blocks of planet. Dr. Jean-Francois Gonzalez, of the Centre de Recherche Astrophysique de Lyon, in France said: "Until now we have struggled to explain how pebbles can come together to form planets, and yet we've now discovered huge numbers of planets in orbit around other stars. That set us thinking about how to solve this mystery." The image under demonstrates the phases of the establishment process for dust traps. The central star is depicted as yellow, surrounded by the protoplanetary disk, here shown in blue. In the first stage, the dust grains grown in size, and move inwards towards the central star. The now pebble-sized larger grains then pile up and slow down, and in the third stage the gas is pushed outwards by the back-reaction, creating regions where dust accumulates, the so-called dust traps. The traps then allow the pebbles to aggregate to form planetesimals. There are two probelms, which are need to be solve in order to become planetesimals. First one is the drag of gas on dust grains in a disk makes them drift rapidly towards the central star and the second challenge is that increasing grains can be broken up in high-speed collisions, breaking them into a large number of smaller pieces and reversing the aggregation process. But in the planet forming disks these problems can be overcome. In these high-pressure sections, the drift motion decelerates, letting dust grains to gather. And the grains can also avoid fragmentation when they strike. Until now, astronomer were in a frame of mind that dust traps could only exist in a definite environment, but the simulation results are showing something else. Their model pays precise devotion to the way the dust in a disk drags on the gas factor. In most astronomical simulations, gas causes the dust to move. Aerodynamic is an effect in which the drag back-reaction happens, is usually negligible, and so up to now they have been gone unnoticed in studies of growing and fragmenting grains. But its effects become important in dust rich environments, like those found where planets are forming. The effect of the back-reaction is to slow the inward drift of the grains, once large enough, the grains are their own masters, and the gas can no longer govern their motion. These impulsive traps then quintessence the grains coming from the outer disk regions, creating a very dense ring of solids, and giving a helping hand to the formation of planets. Gonzalez and his team, and other research groups around the world, now plan to extend the trap model all the way to the formation of planetesimals. Because observatories like ALMA in Chile already see bright and dark rings in forming planetary systems that are thought to be dust traps. Gonzalez said: "We were thrilled to discover that, with the right ingredients in place, dust traps can form spontaneously, in a wide range of environments. 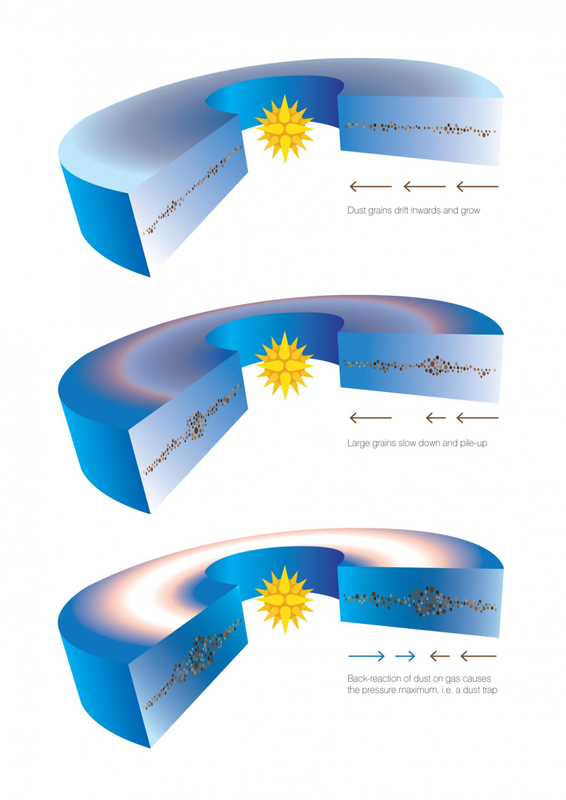 This is a simple and robust solution to a long standing problem in planet formation." The research has been published in Royal Astronomical Society.